A generation ago, while living in Mexico, I came upon the works of Gonzalo Aguirre Beltran regarding the African presence in Mexico, managing to interview him, shortly before he passed away. While Mexico is a nation with deep Indigenous roots, his work from the 1940s revealed a part of Mexico that had been previously unfamiliar to its school children and to the national narrative; its rich multi-racial history. This is especially true when we examine the relationship in this country between Black and Brown peoples, who are often, not taught their shared histories, or even their own histories. One part of that history also includes Mexico, which had abolished slavery in 1829, providing refuge to Blacks during the time of U.S. slavery. It also includes the history of palenques or maroons — free territories of runaway slaves, such as the one established by Gaspar Yanga in 1529, in the mountains of Veracruz, considered Mexico’s first free (Black) city. In the United States, it also includes both peoples fighting against lynchings during the 19th and 20th centuries and Blacks being at the forefront of the desegregation and anti-discrimination struggles, with all people of color benefiting, including Mexicans, who waged their own struggles. Through his census research, he revealed that there were more Blacks in Mexico than Europeans during the 300-year colonial era (1519-1821). And while Mexico’s African presence is not very visible in Mexico today, especially in the media and in its national narratives, it is a great likelihood that a great many Mexicans have some Black admixture within them. The reason for this is that many Africans mixed with native peoples and were also dispersed throughout what came to be known as New Spain, a vast expanse of land from Canada to Central America. And truthfully, these dispersals occurred into the Caribbean and South America; wherever Spain colonized and traded (trafficked, actually). For example, Los Angeles, while led by Spanish soldiers, was founded in 1781 by a majority of people of color… that is, native peoples, mestizos and Blacks or mulattos. In fact, the largest group of the founders was mulattos. Aguirre Beltran’s pioneering findings were suppressed during that era by a nationalistic nation steeped in the ideology of mestizaje and La Raza Cosmica. The first ideology was contrived, yet served a purpose for a nation struggling to forge a unified identify, this in the aftermath of 300 years of oppressive colonialism and several violent and cataclysmic wars of independence (two of its primary leaders were of Afro-Indigenous descent, Jose Maria Morelos and Vicente Guerrero) and revolutions. But mestizaje was but a narrative and an ideology. Mestizaje has generally been taught and understood in Mexico as the co-equal and consensual mixture between the Indian and the Spanish… a virtual impossibility as very few Spaniards came to Mexico during the colonial era and of those that came, very few were women. While the concept of mestizaje is complex, what we do know is that the way it is generally perceived, especially in Mexico, is wrong. If anything, the African, “the Third Root,” which was larger than the Spanish population, would have to be added into the mix, for it to at least make better sense. But even that would lead us to a wrong conclusion. During the colonial era, by law or practice, it was generally illegal for Indian and African men to marry Spanish or European women also. 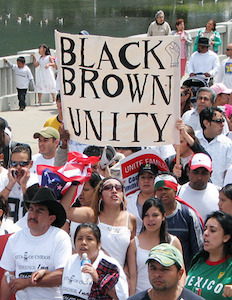 Akin to “La Raza Cosmica” or the theory of the “Cosmic Race,” mestizaje in part is based on the idea of “de-Indigenization” or “leaving the Indian behind.” While it is much more palatable than ideas of racial purity, it nonetheless still is an ideology that displaces the historical, cultural and intellectual Indigenous root of the country and continent. Also, despite its ideal of Mexicans being a mixture of the four races of the world, and thus creating a fifth race, the reality is that both ideologies generally disappear the African presence in Mexico. While Mexico proclaimed pluricultural roots in 1992, only until 2015 did the nation officially recognize the African presence on the Census. That year, Mexicans were given the option of affirming their heritage, which for the first time included African heritage. That year, some 1.4 million Mexicans or 1.2% of the population affirmed that option. In terms of counting Indigenous peoples, the Mexican nation, notoriously and historically through the process of de-Indigenization, has undercounted them. Currently, the Census counts some 13 million native peoples in Mexico, while most of the rest of the population is Indigenous-based mestizo. In this country, especially today in the field of education, we still have sky-high dropout-pushout rates and a school to prison pipeline for students of color. In the realm of human rights, the nation’s prisons resemble warehouses for people of color, and the streets, continue to be killing fields for people of color. As the new president continues to demonstrate on a daily basis, the realities of Black and Brown/Indigenous peoples will continue to be intertwined as they continue to be treated as unwanted and peoples less than human. By knowing their intertwined histories, perhaps both peoples will come to struggle together, which in fact they are increasingly doing so already. Perhaps people can thank the current president for that.